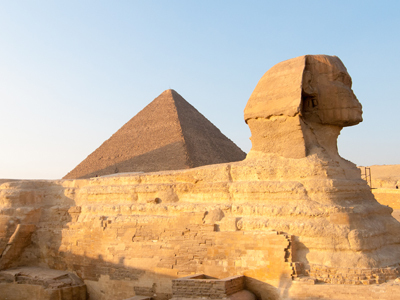 This 8 day exploration of Egypt includes a 4 day & 3 night cruise along the Nile which allows adequate time to thoroughly explore the historic sights of Abu Simbel. 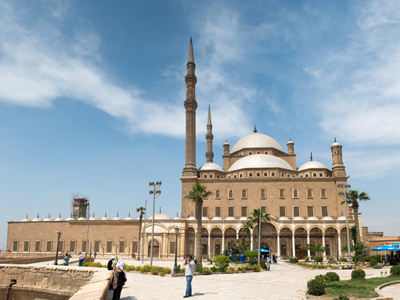 Domestic flights offer spectacular views of various temples and mosques and personal assistance between airports and hotels will prove to you the exemplary service available through our trusted guides in Egypt. Arrive at Cairo International Airport where you will be met and assisted by a representative with your transfer to your hotel. Visit the Step Pyramid of Saqqara; a milestone in the evolution of monumental stone architecture. Continue to the great Pyramids of Giza and the enigmatic Sphinx. 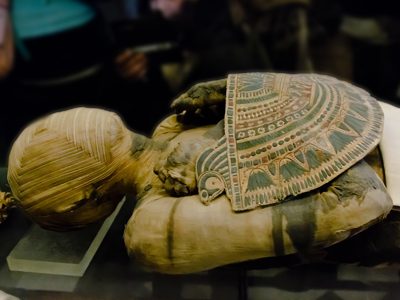 Explore the treasures of the Cairo Egyptian Museum, enjoy a traditional Egyptian lunch and then continue to visit the Citadel of Saladin dominating the hill overlooking Cairo, and the Alabaster Mosque. Transfer to Cairo Airport for the domestic flight to Abu-Simbel. 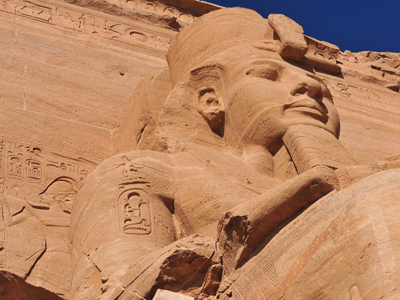 Upon arrival, visit the magnificient Temples of Ramses II & Nefertari. Flight to Aswan. Upon arrival, transfer to the Nile Cruise. 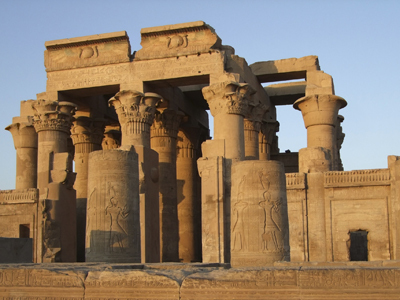 After embarkation, visit the High Dam & ferry the Nile to visit the beautiful Temple of Philae on the Island of Agilika. 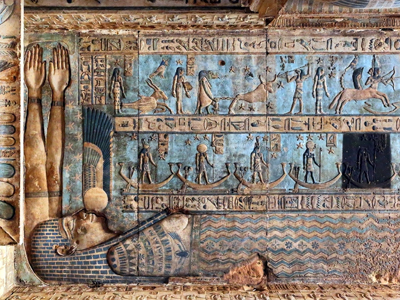 Continue North to Kom Ombo to visit the unusual double Temple of Crocodile deity Sobek. Continue navigation northward to Edfu to visit the Temple of Horus, the best preserved temple in Egypt, and second largest after Karnak. Cross the Nile to visit West Thebes, which includes the Valley of the Kings, Valley of the Queens, Temple of Deir-el-Bahari, and the Colossi of Memnon. 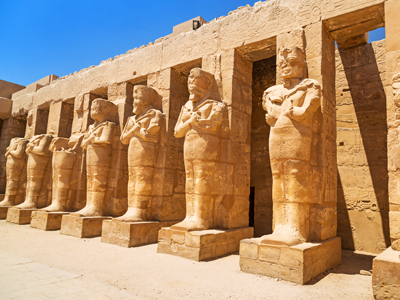 Return to the cruise for lunch and then visit East Thebes and the Temple of Karnak; the largest temple complex ever built by man, and the Luxor Temple; a graceful piece of architecture housing impressive statues of Ramses II. Transfer to Luxor Airport to catch your flight back to Cairo. 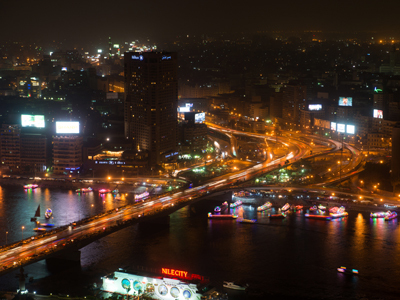 Transfer to your hotel in Cairo and check-in. Check out the hotel after breakfast and transfer to Cairo international airport fo the final departure. *Pricing is based on two persons traveling together, based on availability, subject to change. As dedicated travel specialists, we are here to help you plan the perfect trip. We're with you from the beginning, during the crucial planning stages, throughout your trip in case anything comes up, and afterwards to make sure everything went perfectly. If anything were to go wrong during your trip (missed/delayed flights, etc. ), we and our local in‐country partners are here for you. While we have sample itineraries to help you create the perfect trip, we encourage you to travel at your own pace with a custom itinerary ‐ or simply book accommodation and excursions to travel with full flexibility. We also give you access to an amazing product line that would be very difficult to find otherwise. Our trips directly benefit local communities through a variety of educational, environmental, and cultural initiatives. Additionally, all of our partners have been qualified as upholding a level of service that we truly stand behind. We strive to work exclusively with like‐minded partners who are committed to making sure tourism does not have a negative impact on destinations. Our entire team is dedicated to making this custom journey come true. Request a free quote by filling out the form and please share any details to help us customize this perfect trip just for you. Can’t wait another minute? We understand, call us directly at (866) 577-2462 and speak with one of our extraordinary travel specialists. ... Your information is processing. There was an issue sending your information. This is just one of many authentic travel experiences offered by Global Basecamps. If you are interested in more unique destinations to Egypt with unprecedented planning and extraordinary service visit our main Egypt tours page to browse other sample trips.